I talk too much. Not a lot. Too much. It's become a bit of a joke since I retired and am home alone most days. When the husband walks in the door, I pretty much start talking and don't stop until it is time to say "good night." So this card is for Mike -- he'll get the joke. I'm participating in the Waltzingmouse PJ Party and will enter this under "Old Pajamas" -- meaning the WMS sets were released in the past. Stamp leaves with yellow ink and stamp again with green ink. Shade leaves with yellow and Green Copic markers . 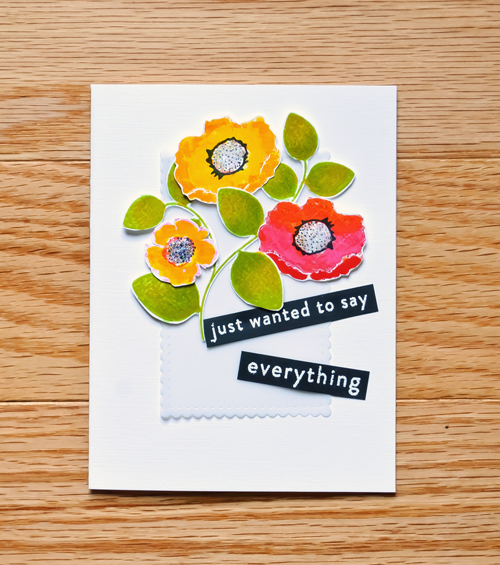 Stamp flowers with Tombow markers and color over with lighter marker. Stamp center of flowers in black. Add Stickles to center of flower. Cut and score A2 card with linen cardstock. Stamp sentiment on black cardstock and emboss. MOOD WHEN DONE = Chatty! Joan, these are gorgeous! I envy your paper trimming skills. My stock answer for why I avoid cutting anything out: If I had wanted to cut things out, I would have been a kindergarten teacher! Delicious card! The coloring is awesome! Joan this is more than a bit special - such colours! fabby card!! Thank you so much for playing along with us at Waltzingmouse Stamps! Joan - your coloring is fantastic - once again! I just love these flowers! And I'm totally getting your joke - I'm the same way when my husband walks in the door! Love the colors and the shading, Joan! Ha! That's too funny. I think my husband is like that. He's the retired one... for the time being. Soon he'll be all talked out. Very cute card! It's gorgeous! Your coloring skills are amazing! I love it! And I'm sure Mike will, too. 💜 really pretty card! Lovely card, Joan. And I'm guilty of talking too much, too, now that I'm once again "between" jobs/careers/whatever! This card is absolutely gorgeous, Joan! I love the flowers with the touches of black for the sentiment. Fab card! Your designs are always so ooooo fresh and modern!! I missed this Joan! Love the wonderful blooms! The sentiment made me smile!